Designed by the team at Korean firm, Baomida, today's project is an intriguing and unique residence. Known as The Grey House, this apartment has been beautifully designed in a monochromatic fashion, employing grey as its main tone. The home offers an abundance of storage space with bespoke joinery imparting that extra level of opulence and attention to detail. 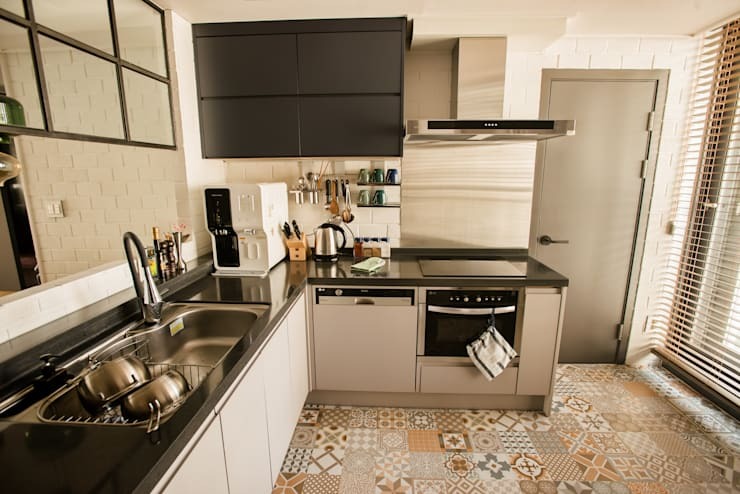 Breaking up the singular use of muted grey hues, the kitchen and dining areas employ a brightly coloured and intricately patterned floor tile. Although small in size, this compact apartment packs a stylish punch. Replete with an atrium, office, and large bedroom, the residence allows its occupants to feel a sense of serenity and peacefulness. As well as looking striking and original in its design, the condo is also timeless and age-defiant. The interior spaces are homely and warm, while providing a contemporary feel, with modern amenities. 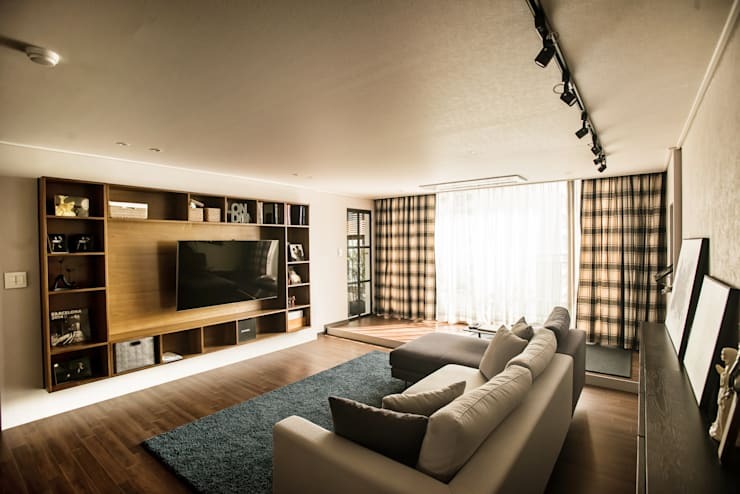 To take a tour of this fine property, and hopefully gain some ideas for your own abode, simply check out the brilliant and inspirational images below. As we enter the dwelling we are hit with an instant feeling of warmth and style. The comfortable living space is awash with natural light, provided by the large wall-sized window. This light helps to create a glowing sensation within the living space, and exudes class as well as a sense of homeliness. Instantly noticeable is the grey décor, which is interspersed with subtle hints of blue, brown, and luscious timber tones. The entertainment unit is a highlight, with its mounted television, and ample storage space for curios and ornamentation. A mixture of textures have also been employed to create interest within the muted colour scheme room. Plaid window dressings are warm and inviting, and the thick shag rug works wonders for the comfortable ambience. Moving through the home we next visit the dining room. This is a highly inventive and original space, which sits directly next to the kitchen. Minimalistic in its approach, the room boasts sturdy timber furniture, with mid-century modern chairs. The bench seating is another neat addition, evoking individuality within this compact space. 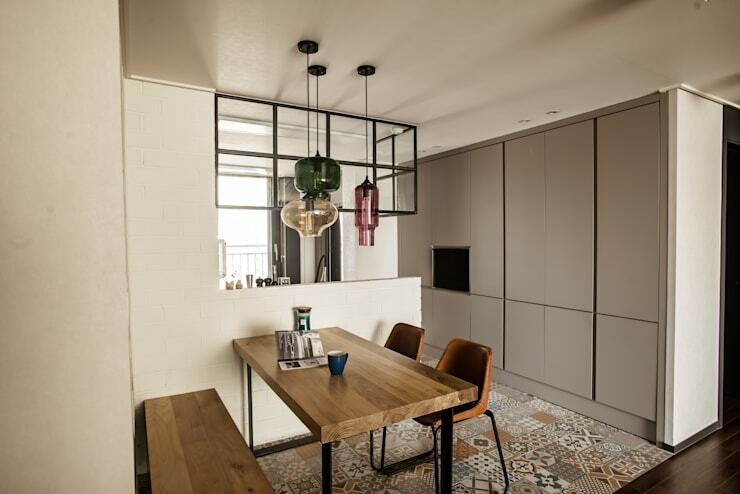 Although the main colour utilised within the home is grey, the eclectic patterned floor tiles add that extra hint of excitement and playfulness. Coordinated with the flooring is also the gorgeously unique light fittings that are delicately hung above the dining table. This room is functional and stylish, imparting practicality and a chic individuality. Have you ever wondered how you might brighten a neutral or muted interior space? In this kitchen the designers have brilliantly solved this dilemma. 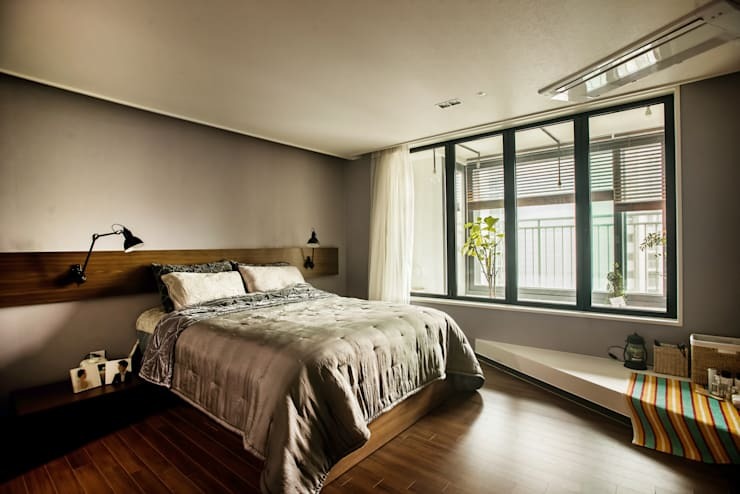 The flooring is a bright yet modest spectrum of many different hues and patterns, coupled with the grey colour scheme of the joinery and walls, which ensures interest and intrigue. In order to create contrast against a predominantly monochromatic palette, the worktop and upper cupboards are a dark charcoal hue. This adds drama to the space, and works beautifully with sleek stainless steel appliances. Is there anything more fabulous than a comfortable, stylish, yet utterly indulgent bedroom? We don't think so, and this room proves it! Stylish, sophisticated, and decorated in a timeless blend of sumptuous textiles and hues, the master bedroom is a light-filled wonderland. Luxuriously furnished, this space is also quite modest in its décor, decorated to feel comfortable, without appearing cluttered. The corner built-in shelf is of particular note, adding a seat that is perfect for reading a book, or perhaps sampling some tasty treats. Throughout the apartment space has been maximised. Situated directly behind the bedroom there is a neat nook that offers the occupant a place to read or study, with ample shelving for an impressive book collection. The joinery has been cleverly located in an area that might normally be left unused. In this instance it has become a fabulously practical area, ideal for a range of purposes. 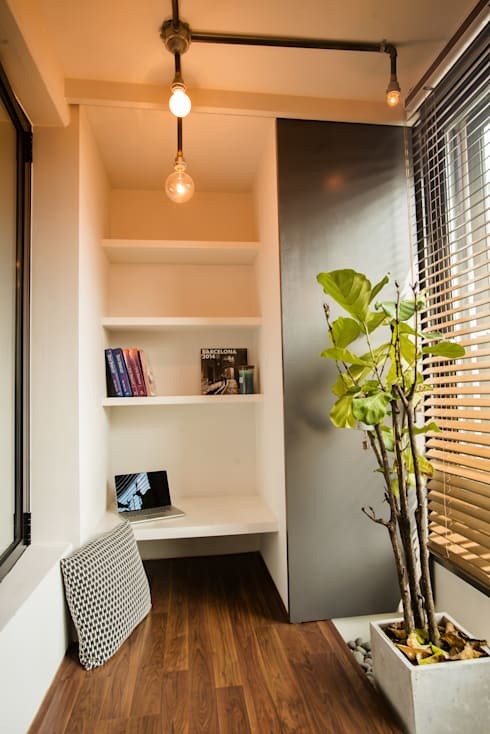 If having the study nook wasn't enough, this apartment is also replete with a full-size home office. 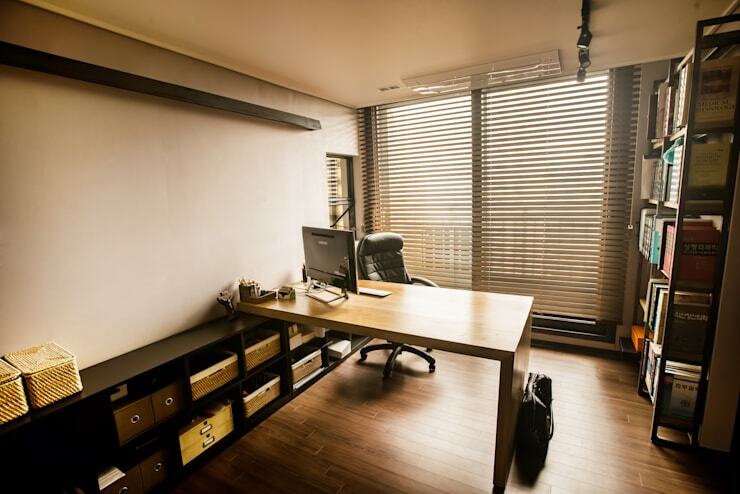 These days home offices are becoming an essential for many different individuals. If you feel like you need an extra place to get a little work done, then a home office is a fabulous solution. Boasting ample storage, shelving, and high quality furnishings, the room is a great example of how to design and decorate a modern home study or workplace. Sauna-esque in its style and design, this room is the final space that we are taking a look at today. The bathroom is cosy, snug, and replete with a combination of rustic tones and grey tiles. 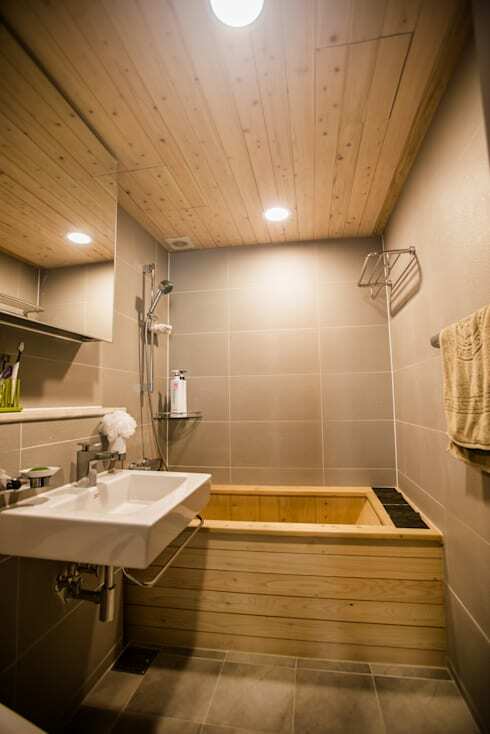 The wooden bathtub is the focal point of the space, and matches wonderfully with the timber-clad ceiling. The mirrored cabinet presents a modern addition to the room, imparting functionality, as well as a contemporary edge. What did you think of the way the designers created a monochromatic grey apartment? We'd love to hear your thoughts in the comments below!